Welcome to the first edition of Chez nous online! Here you’ll find all the articles from the current printed edition of Chez nous as well many news items, events and other information found only on the online edition. This is the time of year when people are making their wish lists. And it’s not just about Christmas presents; it’s also time to make our wish list for biomedical equipment. As in years past, we’re asking certain managers to coordinate the gathering of information for what’s required in their area and prioritize those needs. It’s important to provide the most precise information possible as well as a cost estimate for the items in order to better respond to the requirements of the Agence and the Foundation, who are our principal sources of financing, and also to minimize the delay in acquiring any item which is selected. The process should be completed before the start of the new year. So stay tuned in the coming weeks since it will be time to prepare our wish lists! Expect some surprises this year as we prepare to celebrate the 10th anniversary of The Montreal Children’s Hospital Foundation Awards of Excellence. The Foundation will soon be asking you to submit the name of someone who you think has earned a place, through their work, actions and dedication, among this year’s honourees. Nomination forms will be available as of early December, and will be accepted until February 27, 2009. The deadline is a little earlier than previous years to allow us to choose the winners and share the good news as early as possible. If you have a colleague who has always impressed you, it’s time to nominate them for an Award of Excellence. Thank you in advance - the team at the Foundation is counting on you! Info: Valerie Frost , Director of Special Events, MCHF, ext. 29253. Once again, we are organizing our annual Christmas appeal to help needy families of the MCH have a merry Christmas. This year again, we will not be matching hospital departments with specific families. Instead we will be collecting donations of food vouchers and new toys to distribute to the families. We would ask that any donation of money from your department be used to purchase vouchers from Maxi, Provigo, Loblaws, SuperC, Metro, IGA, Zellers, Wal-mart, or Toys R US. If you or your department wish to contribute, or if you require additional information please contact Suzanne Desfosses at ext. 22508. The MCH recently began offering a new treatment to help babies who did not get enough oxygen due to a problem during pregnancy or during delivery. The lack of oxygen can cause damage to the child’s brain which can cause mental and physical delays in the child. Lowering the baby’s body temperature may lessen the damage to the brain and several studies have shown that Total Body Cooling may also improve the baby’s chance of survival. The process involves placing the baby on a cooling blanket and slowly decreasing body temperature to 33.5 Celsius. This lasts for 72 hours then the newborn is slowly warmed up to a normal body temperature. Blood pressure, heartbeat, and temperature are closely monitored throughout the process. 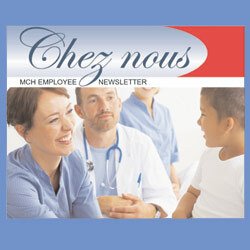 The MCH is the only pediatric centre in Quebec to offer the treatment. The deadline for Centraide donations is November 30. Visit the MUHC intranet site  to make your donation today! MCH professionals had another busy month of interviews for television, newspaper and Internet media. Dr. Michael Kramer and Dr. Frances Aboud were interviewed for a future broadcast of Télé-Québec’s current affairs show Une pilule, une petit granule about their research on the benefits of breastfeeding. TV5 reporter Jennifer Letarte interviewed Dr. Sharon Abish on long-term sequelae of cancer. Dr. Harvey Guyda was featured in an article in The Gazette that was also published across Canwest media outlets on the issues surrounding growth hormone therapy for children of short stature but who are otherwise normal. Join in the fun at this year's employee Christmas party. It’s a chance to enjoy a break from the everyday routine and celebrate the season with your colleagues! Mini Concert for patients and staff November 27. She has headlined her own show at the Montreal International Jazz Fest, and has performed alongside legendary artists like Oliver Jones and Céline Dion. On November 27, young Montreal jazz-pop signing sensation Nikki Yanofsky will be performing a few songs for the children, parents and staff at The Montreal Children's Hospital. Nikki's short performance will take place in the 2B Outpatient Clinic Area at 2:00 pm. On that day, the budding star will be visiting the hospital in preparation for the Telethon of Stars which hill be held on December 6 and 7 on CTV and TQS. Tina Primiani has accepted the position of Clinical Nurse Specialist, Neurosurgery-Neuro-Oncology on the surgical unit of the MCH. Tina brings with her 8 years of nursing experience; she is currently completing her MScN(A). Tina will start her new position on November 24. Her office will be C1128. The Pediatric Chairs of Canada (PCC) recently announced the recipients of their Academic Leadership Awards. In a communiqué, members of the review committee indicated that the competition was very close this year, which makes the awards to Dr. Charles Scriver and Dr. Wendy MacDonald even more significant. On a related note, Dr. MacDonald also received the Osler Teaching Award from McGill graduating medical students for the fourth time. No faculty member has ever received this honour more than once.